A123 Systems announced today that it will supply complete lithium ion battery packs to Tata Motors, India's largest automaker, for Tata's hybrid electric systems for commercial vehicle applications. A123's highly scalable battery packs are designed to fit into multiple powertrain architectures that can be implemented into a wide variety of commercial vehicles, providing Tata with a cost-effective solution for meeting its performance, range and durability requirements. "We consider hybridization to be an integral component of Tata Motor's overall strategy, and hybridization of our commercial vehicles is particularly important to our global customers for reducing the emissions and increasing fuel efficiency of their fleets," said Dr. Timothy Leverton, Head - Advanced and Product Engineering at Tata Motors. "A123 Systems' core lithium ion technology has a proven track record of success in the hybrid truck and bus segment, which we believe represents a very significant market opportunity. In addition, the modularity of A123's pack design enables us to develop a uniform hybrid powertrain architecture that can be deployed across multiple vehicle platforms." Initially expected to be deployed on city transit buses during the second half of 2012, A123's lithium iron phosphate battery packs will be built using the company's prismatic cell technology, which offers high power capabilities, increased usable energy over a wide state-of-charge (SOC) range, excellent safety and long cycle and calendar life. 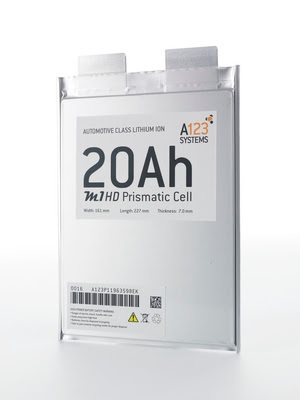 A123 will deliver complete systems that include robust battery management electronics, and the compact form factor of the prismatic cells enables A123 to design highly-scalable battery packs that are intended to seamlessly configure to Tata's hybrid electric powertrain architecture. "The addition of Tata Motors to our growing portfolio of blue-chip customers reinforces our position as the leading provider of lithium ion battery technology for the truck and bus segment," said Jason Forcier, vice president of the Automotive Solutions Group at A123. "We believe that this announcement further validates the performance attributes of our Nanophosphate lithium iron phosphate technology and underscores our systems integration expertise. A123 understands the value proposition for commercial fleet hybridization, and we believe we can help Tata cost-effectively expand its portfolio of hybrid electric vehicle offerings to allow its customers to take advantage of the long-term benefits of fleet electrification."